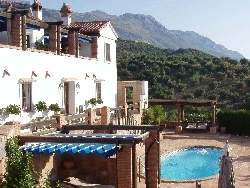 VILLAS AND APARTMENTS TO RENT IN RONDA, SPAIN. 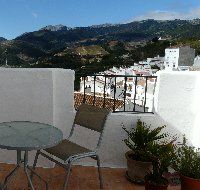 Welcome to our selection of holiday homes to rent in Ronda, Spain. The mountain town of Ronda, 100 kilometres north of Malaga, is one of the most popular day trips for tourists staying on the Costa del Sol, and is often full of coach parties during the summer months. It is easy to see why Ronda is so popular, with its spectacular architecture, stunning scenery and range of sporting activities. There is enough in the surrounding area to keep visitors entertained for a few days, if you decided to make this town your base and visit the Costa del Sol for a day trip, rather than the other way around. The entrance to the ancient city of Ronda is one of the most impressive features; the new bridge, spanning a deep ravine is the only way to get into the older parts of the city. The current bridge was finished in 1793 and stands at a height of 98 metres above the bottom of the ravine. Many of the oldest features in Ronda date from Moorish times, including the city walls and remains of the fortress and the ruins of the Arab public baths. There are several churches and palaces dotted around the narrow, winding streets of Ronda which date from later centuries, while some of the more intriguing attractions include the 15th century �Giant's House�, named for the two large sculptures that decorated its exterior and a prehistoric cave, complete with cave paintings, only discovered in 1905. While there is more than enough to keep visitors in Ronda for a whole day, if you only have a short time in the area, you shouldn't ignore the surrounding countryside and scenery. There are three nature parks within a short drive of Ronda, all of which offer walking trails of varying difficulties and length. You can choose to join a guided tour, some of which are in English, to learn more about the environment, or follow one of the marked trails from maps that are available at the local tourist information office. For those who prefer something a bit more active than hiking, there are centres that offer rock climbing, canoeing and even archery, with equipment rental and the help of a guide usually included in the price. More extreme sports, like canyoning (following the route of a river and jumping from waterfalls) and caving are becoming more popular too. You can always relax after a long day of adventure sports by visiting one of the region's vineyards or sampling their produce with your evening meal. 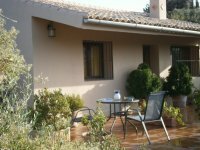 Looking for self catering holiday accommodation in Ronda? Then below is a selection of holiday villas in Ronda and holiday apartments in Ronda that can be rented direct from their owners. You can either click on each listing for further details or you can use our search engine on the left if you are looking for something in particular. When entering the ancient city of Ronda, you will see when crossing the El Tajo, one of the more impressive features, Puente Nuevo (the new bridge) and also the grandest bridge. Even if you�re only in Ronda a day, one thing is not to be missed. You should ensure you view the amazing scenery and surrounding countryside. There are 3 nature parks only a small drive away from Ronda all of which offer different types of trails with different lengths and different difficulties. You may want to be escorted around the trail by a guide or follow the trail yourself, as there are maps available from the tourist information office. If you like something more adventurous, there is a range of more physical activities such as; rock climbing centres, canoeing and maybe archery for those who want to give that a try. If you are feeling hungry after a day full of fun and tiring activities, there is a range of vineyards available within the local area. Why not visit the bullring? See the place where 3 generations of the Romero family introduced modern bullfighting to the world. One of the oldest bullrings in Spain, it is one of the most historic exciting bullrings. The rise of bullfighting industry led the Royal Cavalry of Ronda to create the great bullfighting ring, which was created by Mart�n de Aldehuela, the same architect who also created New Bridge over the Tajo of Ronda. Building the bullring took a total of 6 years. It was opened in 1785 during the legendary days of Pedro Romero�s reign as champion bullfighter. The bullring was made entirely of stone. Only a 30-minute drive from Ronda is the Cueva de Pileta, which contains paintings that are over 25,000 years old. If you have an interest in art, visiting the Cueva de Pileta is a must. The caves were discovered by a farmer by the name of called Jose Bullon Lobato in 1905. Within the cave, there are a number of markings on the wall, which includes drawings from stick men hunting, zigzags and even a picture of a horse�s head. They started building Puente Nuevo in the year 1759 and finished the bridge in 1793. It took a total of thirty-four years to truly finish this piece of work. The Puente Nuevo Bridge was built to replace the bridge, which collapsed while work was still going on in 1941 killing 50 people. To get the best viewing of the bridge, you truly have to get overview, a view for below the bridge and a view from the side to funny see fully the whole bridge structure and to understand truly how the bridge came to be built and how it was built. The El Tajo gorge splits the City of Ronda into two sections. Those sections are known as La Ciudad and El Mercadillo. The gorge has acted as one of Ronda's main defences. The gorge is quite narrow at 68m but drops down up to 120 metres in places. Lara's museum is a new attraction now open in the Ronda area. Inside, there are artifacts showing the local custom and shows how lifestyle has changed over the years. It includes a range of artifacts such as 17th Century weapons, old bullfighting equipment, a variety of old armaments torture instruments from the Inquisition, early cameras and much more. The small mountain town of Ronda is located 100 kilometres north of Malaga. Ronda is a more popular resort for day trips for tourists who are staying in the Costa del Sol area. With its amazing architecture, beautiful scenery and a range of sporting activities, it�s easy to see why Ronda is a popular place to visit.